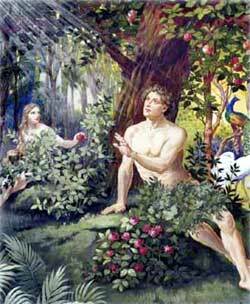 Adam and Eve enjoy the Garden of Eden. HIS GREAT WORLD in which we live did not always exist. The broad expanse of sky, which smiles upon us when days are fair, and frowns and weeps when days are foul, did not always form an arch above our earth-home. Long, long ago there was no world at all. There was no sun to shine, there were no stars to twinkle, nor moonbeams to play through the night shadows. But even then there was God; for he ever has been and always shall be the same unchanging Divine Being. On the second day God made the beautiful blue sky, and placed above the water-covered earth clouds to carry the sky-moisture. He called the sky Heaven. On the third day he caused the waters to flow together in wide, deep places, and he called them Seas. Dry land then rose up, and this he called Earth. But as yet there were no grasses, flowers, nor trees-the whole earth was barren and desolate. So God caused a carpet of grass to grow upon the bare ground and beautiful flowers to spring up from the earth. The trees and herbs also he made to grow at his will. When God beheld all these things he saw that they were good. On the fourth day appeared the great lights which we see in the sky-the sun, the moon, and the stars. These he made to divide the day from the night. After these things were made, God began to create living creatures. He made fishes of all kinds and sizes to swim about in the seas and birds of every description to fly about above the water and land, just as we see them doing today. Thus the world continued to become more delightful, and the fifth day of the first week of time passed by. On the sixth day God made all the animals, great and small, and every creeping thing. Then there was life abounding in the woods and on the plains, as well as in the air and in the sea. What a beautiful world! Still what a strange world, for there were no people in it! Not a home anywhere-not a man, woman, nor little child to be seen. What a very strange world indeed! But God had not yet finished his work of creation, for he wished to have people live in the wonderful world he had made. They could enjoy its beauties and take care of it as no other living creature could do. And more, they could know who had made all these great things, and knowing God they could love and worship him. So it was that God made the first man. Out of the dust of the ground he made the man's body, then he breathed into that body with the breath of life and man became a living soul. This first man God called Adam, and to Adam he gave the power to rule over all the other living creatures. These animals and birds he brought to Adam, and Adam gave each of them a name. But not one of them did Adam find suitable for a helper, and because he needed a helper very much God made for him a woman. This woman became Adam's wife, and he loved her very much. He called her name Eve. When the sixth day ended God had made the world and had placed everything in it just as he wished, therefore on the seventh day he rested from his work.